Release date leaked ahead of announcement? 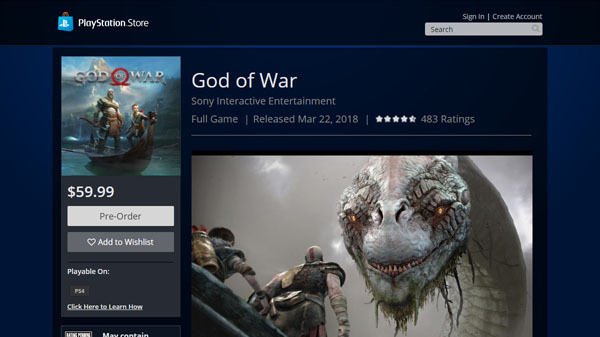 At least two regional PlayStation Stores—North America and Chile—have listed the new God of War for PlayStation 4 with a March 22, 2018 release date. According to Google Cache, the PlayStation Store listed God of War with a placeholder release date of December 31, 2018 release date up until December 3, meaning the change was applied today. March 22, 2018 is a Thursday, which is not a standard release day for Sony-published video games, which are generally released on either Tuesdays or Fridays. However, March 22, 2005 was the release date of the original God of War in North America, so it is possible Sony is planning to launch the new God of War on the same date as the original game. That, or the release date is an error. Currently, Sony has only announced God of War as due out in early 2018. With The Game Awards 2017 and PlayStation Experience 2017 coming up later this week, however, it is possible Sony is preparing to announce the official release date.